We were excited to see our Prasad Medical Grade Skin care products reviewed on the Social Media site Joonbug.com. Joonbug is NY’s Definitive Guide To NYC Events & Nightlife. Read their review below. If you’re not familiar with Dr. Amiya Prasad, he’s a renowned Manhattan plastic surgeon. We know the word “plastic surgery” is still pretty scary for a lot of us, but Dr. Prasad’s approach to skincare is simple, effective and excellent for all skin types and ages. 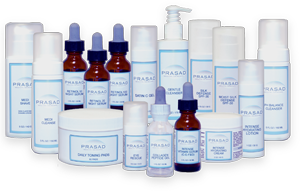 Whether you battle acne, sensitive skin, dry skin, rosacea or wrinkles, Dr. Prasad has a solution for you. No fancy packaging or frills, just quality products that are fragrance-fee and PH balanced. We personally used his products before reviewing them and can attest that they do exactly what they claim. Some of the products we tried were the PH Balance Cleanser, the Gentle Cleanser, the Silk Defense SPF 30 and the Moist Silk Defense SPF 30. Most importantly the products did not clog our pores, irritate or cause any reactions on our normally sensitive, finicky skin. There’s no fragrance or fillers, just effective ingredients. Highly fragranced products are so irritating and unnecessary, so it was refreshing not feel like we were putting perfume on our face. We even took our eye makeup off with the cleansers and experience no stinging or problems. Dr. Prasad also offers an array of spa skincare services, such as microdermabrasion, chemical peels, fillers and more, if you’re looking for a little extra help. Going from cold exteriors to warm interiors frequently can create a flushed red-faced complexion. This is caused by the straining of blood vessels in the skin, especially on your face. These temperature changes can unfortunately result in broken capillaries. Using a topical or cream that contains peptides can help protect and plump up your skin so the broken veins won’t show! We recommend Prasad Medical Skincare’s COLLAGEN PEPTIDE GEL for your face and EYE RESCUE for beneath your eyes as peptide solutions for your skin during colder weather. Prasad Medical Skincare’s Collagen Peptide Gel is a Hyaluronic acid-based gel designed to enhance skin moisture, reduce signs of photoaging, and increases production rate of collagen to erase fine lines and wrinkles. Containing peptides such as Palmitoyl oligopeptide and Palmitoyl tetrapeptide-7, short-chain amino acids that mimic fragments of human collagen, the peptides in this facial gel are demonstrated to increase the proliferation rate of human dermal fibroblasts which produce collagen, thus improving the dermal support matrix and reducing fine lines and wrinkles. Additionally, the Collagen Peptide Gel contains Glycosaminoglycans and Sodium chondroitin sulfate, clinically demonstrated to inhibit matrix metalloproteinases which are generated by UV exposure and can break down collagen and elastin fibers within the skin. This product is a water-based vehicle that is oil-free, fragrance-free and non-comedogenic, appropriate for use under make-up, sunscreen or moisturizer, or as a light-weight moisturizer for acne-prone skin. Applied to the face and neck every morning after cleansing for best results. Prasad Medical Skincare’s Eye Rescue is a high-potency combination of ingredients specifically addressing the needs of the eye area, combining protective anti-oxidants, soothing emollients and firming peptides. Eye Rescue helps to diminish the appearance of dry skin, fine lines & wrinkles, puffiness, and dark circles under the eyes. Eye Rescue contains Tetrahexyldecyl ascorbate, which stimulates collagen production, provides anti-oxidant protection, inhibits cell damage and provides skin clarifying and brightening actions by lightening melanin granules. This anti-oxidant activity is supplemented by Vitamin E acetate and Green Tea. Eye Rescue also contains Acetyl hexapeptide-3, a short-chain synthetic peptide that inhibits muscle contractions in the skin, resulting in muscle relaxation and smoothing of dynamic skin wrinkles. Prasad Medical Skincare also has other great medical grade skin care products that can keep your skin healthy and young all year long!